I have accomplished remarkably little knitting during my unemployment for reasons which completely escape me. This week I put my nose to the proverbial grindstone and finished some things. 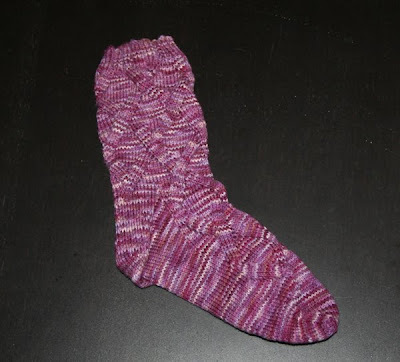 First, the Wanida sock which I started waaay back in early June. Shameful! The flash really washes out the color. It's actually a rather vibrant purple. 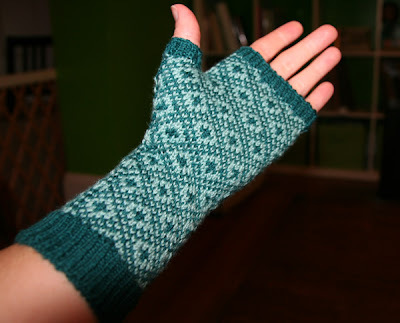 Next is the first of my Endpaper Mitts. I have to say that I'm not especially excited about starting the second portion of either of these projects, but especially the Endpaper Mitts. I will do it because I like completion, but I'm not super happy with this project. The pattern includes 3 different sizes, but they are completely based on needle size, which of course means a change in gauge. I originally started this on a smaller size needle and it was too small - it is still a little tight, but much better. The problem is that now that I'm knitting at a looser gauge, the colorwork isn't as crisp and clear as it was. From a distance it looks good, but up close it looks sloppy. I'm hoping that blocking will improve it. I've also been working on the second sleeve of my Lucy In the Sky Cardigan, and I'm happy to say that I am most of the way through it. I believe I have something like 26 rows left. I'm especially excited about this project, because there is nothing like the satisfaction of seeing a beautiful sweater really come together! That mitt is beautiful - I love the color! I'm so impressed with your knitting skills. A Cause for Great Excitement!